Steve Wilkinson, Nick Bollettieri and Vic Braden joined the ranks of only 13 others when they were inducted into the United States Professional Tennis Association (USPTA) Hall of Fame September 27 during the USPTA’s national awards luncheon at the World Conference at the Hyatt Regency Grand Cypress in Orlando, Fla.
During the association’s April Executive Committee meeting, the USPTA Board and Executive Committee voted unanimously to rename the Hall of Fame Award in honor of the late Tim Heckler, who served as the CEO of the USPTA for 30 years from 1982-2012. 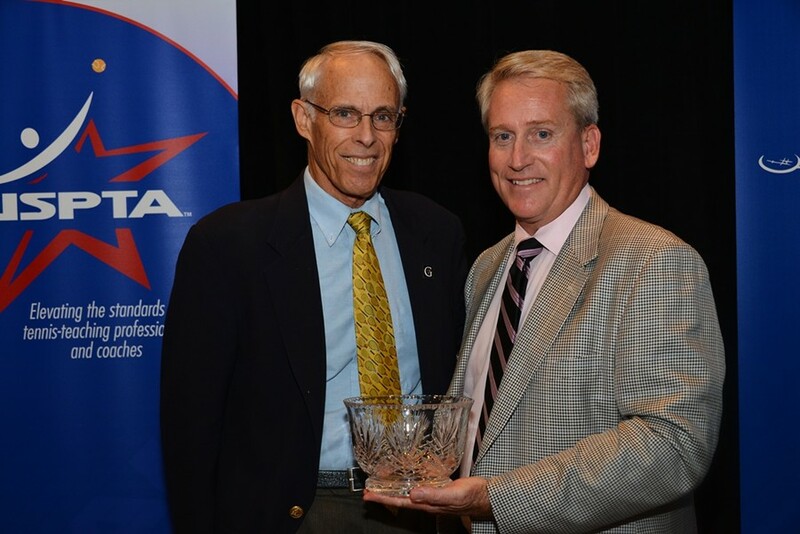 The award now to be called the USPTA Tim Heckler Hall of Fame Award. Wilkinson was the head men’s coach at Gustavus Adolphus College, St. Peter, Minnesota for 39 years from 1971-2009 and is the winningest coach in the history of men’s collegiate tennis with 923 victories. He has coached 46 players to 87 all-America honors. He founded the Tennis and Life clinics/camps more than 25 years ago and has dedicated his time and effort to improving tennis performance of youth and adults while teaching life lessons that can be used off the court. Bollettieri has been one of the most influential people in tennis. He founded the Nick Bollettieri Tennis Academy in Florida in 1978, which was the first full-time tennis boarding school to combine intense training on court with custom-designed academic curriculum. His approach led to 10 No. 1 players in the world including, Andre Agassi, Boris Becker, Jim Courier, Martina Hingis, Jelena Jankovic, Marcelo Rios, Monica Seles, Maria Sharapova and Venus and Serena Williams. Braden has impacted tennis as a player, teaching professional and broadcaster. He is the founder/director of the Vic Braden Tennis College in Coto de Caza, Calif., co-founder of Vic Braden Tennis College at Star Island Resort in Kissimmee, Fla., and co-founder of Vic Braden Tennis College in St. George, Utah. He and Jack Kramer co-founded the Jack Kramer Tennis Club in Palos Verdes, Calif. He has authored numerous books including “Tennis for the Future,” “Teaching Children Tennis the Vic Braden Way,” “Quick Fixes” and “Mental Tennis.” As a professional player, he was invited to play in the World Tennis Championships three times.